Marketing works best when it connects your customer’s description of their problem with your product. But not all your customers understand and describe their problem in the same way. You need more than one way to frame your offering. If you’re in the Trello/Asana/Basecamp product space, you could try the specific but same-y “Project management simplified”, or you could try the visionary but vague “Better collaboration for everyone”. Customers have many different starting points, but it’s important that all roads lead to you. The former is direct and attracts only people who already know they need to manage their projects better. It doesn’t grow the market for project management tools, it just speaks to the pre-existing demand for them. The latter is broad, and will attract anyone who thinks they should collaborate better. This grows the market. It now includes people who didn’t even realize they need such a tool. It also attracts people who don’t even think they work on projects. Cennydd Bowles once wrote “I want a spade, not the experience of digging” to show how marketing often drifts too far into the clouds of abstraction. Some customers know how to solve their problem, some customers don’t, some don’t even think they have a problem. But they’re all potential customers, and you need a way to connect with each of them. Customers have many different starting points, but it’s important that all roads lead to you. The job of marketing is to build these roads. 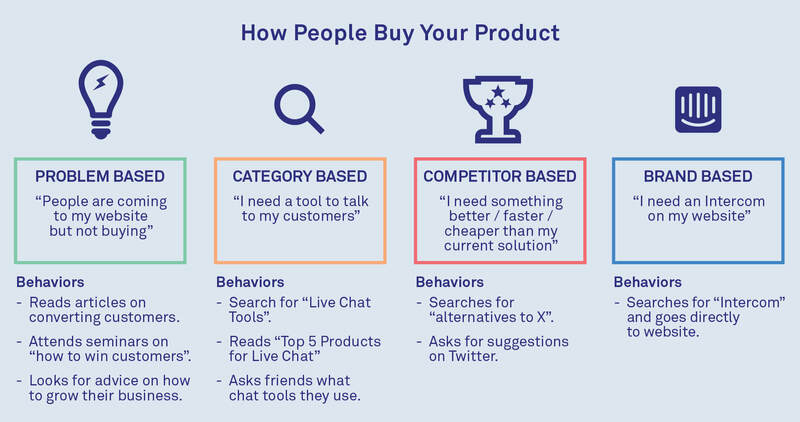 For example, here are four ways people can end up using our Acquire product. These customers speak only in the language of the business pains they feel. When you’re marketing to these customers remember your indirect competitors play a role here. Everyone from A/B testing tools through to growth hacking conferences are offering to “boost your conversions”. Education is needed to help them believe your product is the most likely to solve their problem. These customers are drawing a conclusion from their problem. They think they know what type of product they need. In these cases you’re either looking to establish brand preference (so they believe you’re the best in this category), or to take the brand relevance approach (you create a new category in which you are the only player). Happy customers don’t shop around. They have better things to do. So when someone is searching for an “alternative to X”, they want a better version of what they have today. When someone is unhappy with their current product, you can market your product around how much better it is than their current solution. Here, you need to understand the four forces, and have dedicated marketing pages explaining why you are different to their current solution (as opposed to just re-hashing your usual marketing). Frisbee, Kleenex, Google, Biro, Band-Aid. They’re everyday brands with relevance so strong they define their categories. The connection between the problem and the brand has become hardcoded in customers’ minds. When someone sneezes they think “Kleenex”, not “My current problem is a runny nose, how do I resolve that?” or “I believe I require a product from the face-wipe category, I wonder what is the optimal solution”. If you’re not the brand of preference and you’re competing against a product synonymous with the solution, you have a long road ahead of you. It’s rare you’ll win a direct head-to-head with an incumbent, so you need to identify niches for initial traction. Dave McClure calls this the niche to win strategy, and it can be seen in everything from software products to fast moving consumer goods. There were lots of messaging apps, but only one “messaging app for teams”. There were lots of payment platforms, but only one “built for developers”. As you grow you can deploy competitive marketing to help customers see the migration path from their current solution to yours. To believe there’s only “one way” to market your product is to believe that there’s only one type of customer, in one type of buying state, that you want to attract. In software this is simply never the case. So having a plan for these four starting points is the foundation of any marketing strategy.